The beginning of our pisikoa fame here in Sāmoa. – I didn’t expect that I would be living with a host family (for the next 10 weeks) who speaks minimal English, but the amount of love they are providing me allows me to feel secure and comfortable. Dinnertime conversations are nonexistent, but we’re learning to make it work. – I didn’t expect that I would have to attend the first church service in our host community, which fell on White Sunday—a very important holiday in Sāmoa that celebrates children—and still feel the presence of God overcoming the language better. 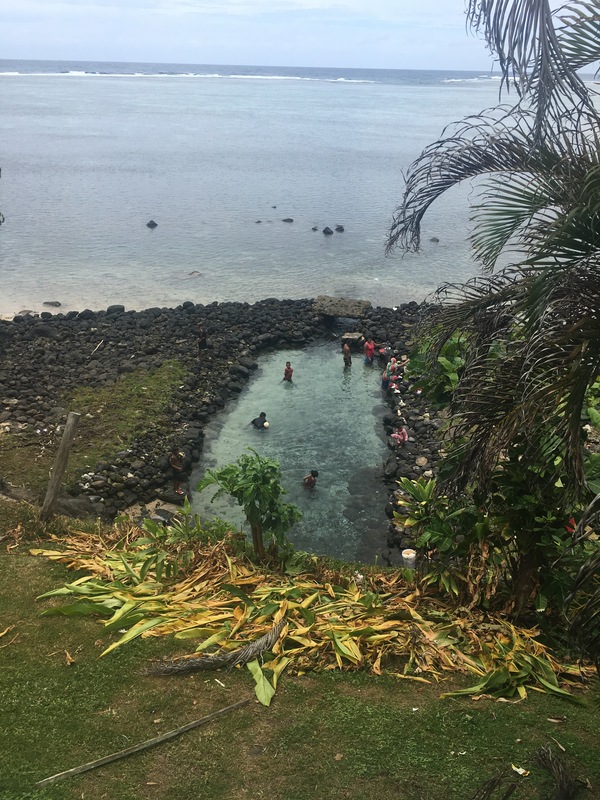 – I didn’t expect that I would feel grateful and excited to sleep in a mosquito net and since there is no running water in my host home, that I would prefer to bathe in a natural pool by the sea over a bucket shower. – I didn’t expect Bingo to be a thing here. My village LOVES Bingo—there’s a game EVERY night (except Sunday)—and they take it VERY seriously. It definitely provided me with a crash course in learning the numbers (“lima lima” = 55). – I didn’t expect that going off the grid and not having steady internet access would feel this refreshing. I have enjoyed not feeling the “need” to be connected 24/7. Also, Sāmoan cell phone plans really jib you on data so I’m sorry if I don’t get back to your emails and messages in a timely way. I’m still figuring it all out. – I didn’t expect that hearing “You’re doing great, sweetie” would fill me with so much laughter and support. Have I mentioned how much I love my group-mates? Because I really couldn’t imagine it without them. They have made this that much more of a soul smashingly beautiful experience and it’s only week one. There’s a transformative power in seeing the familiar from a new, more distant perspective and this lush island has taught me so much in the little time I’ve been here. I can’t wait to learn more! 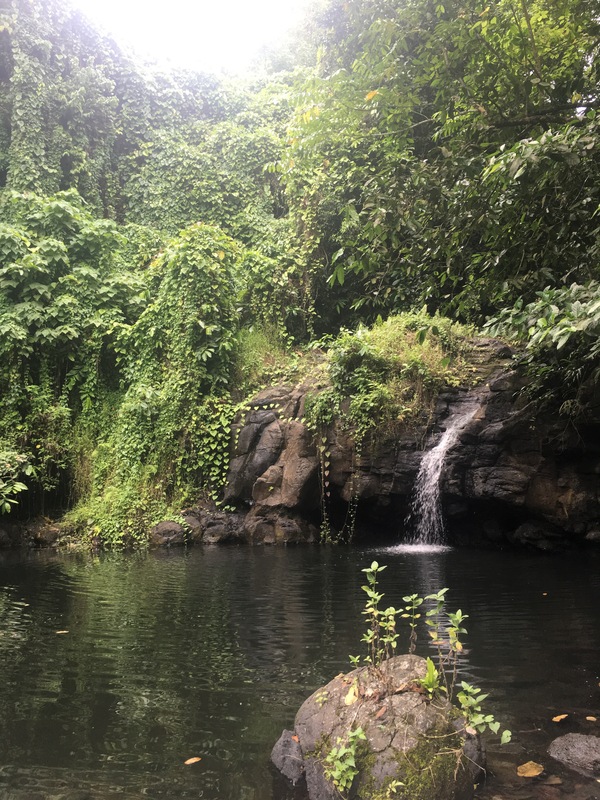 I was also able to hike to my first Sāmoan āfu (waterfall). “I’m starting with the man in the mirror…” It isn’t easy, but it will open you up to seeing things differently for the rest of your life. Enjoy every minute. Even the difficult times will be life changing. I am so happy for you, thank you for sharing your journey with us. I’m so happy for your accomplishments in your life and this trip filled with adventures during your 2 years stay in Samoa with the Peace Corps , will add so many things at different levels in your life .